Étouffée or etouffee is a Cajun dish typically served with shellfish or chicken over rice and is similar to gumbo. It is most popular in New Orleans and in the bayou country of the southernmost half of Louisiana. Left: Crawfish étouffée, served at a restaurant in New Orleans. In French, the word "étouffée" (borrowed into English as "stuffed" or "stifled") means, literally, "smothered" or "suffocated", from the verb "étouffer". 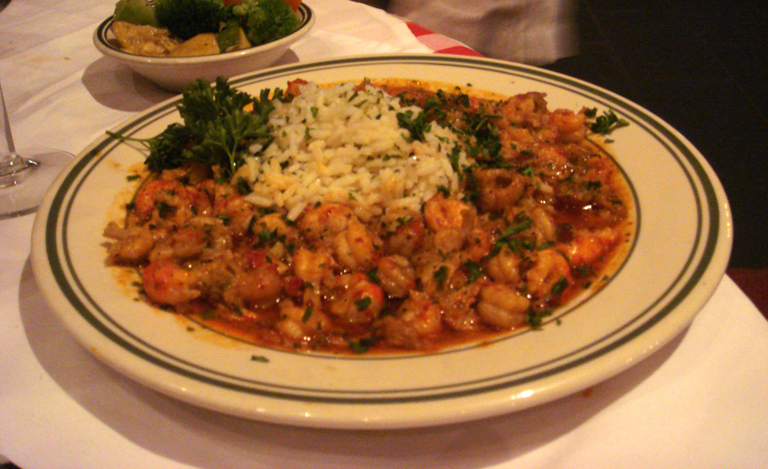 The usual staple of an étouffée is seafood such as crawfish, shrimp, or crabmeat. Other meats, such as chicken, or a combination of chicken and seafood, are also used. The base of an étouffée is either a dark brown-red roux, a blonde roux (a roux that isn't browned as much) or simply onions cooked down in butter. Like many Louisiana dishes, onions, green peppers and celery (a combination often referred to as the holy trinity) form the base of an étouffée. It is usually seasoned with cayenne pepper, white pepper, garlic, and salt and has a thicker consistency than gumbo. A crawfish étouffée, if made with a roux, usually has a reddish color: this is sometimes mistakenly attributed to crawfish fat (an important ingredient). Crawfish fat is bright yellow, and will not color the dish red: the red color comes from the dark brown-red roux. Seasonings the crawfish were boiled in could also give the dish a red tint. There is typically no tomato in this dish. However, in some areas it has become popular to add tomatoes or tomato paste to the dish. A dark-red brown roux is used to make étouffée, which requires the use of vegetable oil rather than butter. Butter burns more easily than oil and it is difficult to make such a dark roux without burning the butter. Advice: When crawfish are not available, substitute shrimp, scallops, or lobster. On low heat, melt butter in a deep, thick aluminum chicken frying pan. Add chopped onion and bell pepper. Saute until onions are clear in color --- at least 10 minutes. Season crawfish with cayenne pepper, salt, paprika, and black pepper to taste. Add seasoned crawfish, garlic, and water. Cook slowly. As water cooks down, add a teaspoon of flour at a time and stir until color of sauce turns a golden brown. Cook until crawfish are soft to the bite (around 40 minutes). Serve on rice and garnish with onion tops and parsley.